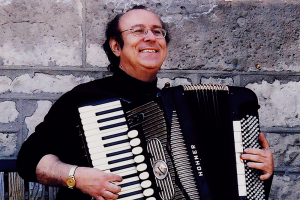 Musician, performer, and educator Joseph Macerollo is one of the talented accordion players who joins us for Squeezebox on February 10. Alongside his protégé Michael Bridge, Joseph will explore a selection of contemporary works, including several which were commissioned specifically for him, like La Testa d’Adriane by Canadian composer R. Murray Schafer. 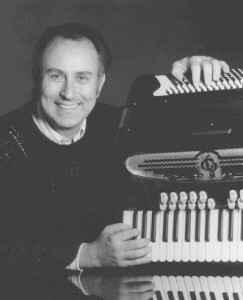 As an educator, Joseph pioneered the acceptance of the accordion at the Faculty of Music, University of Toronto and at Queen’s University in Kingston. He has lectured, given workshops, written articles and reviews of concerts and taught history of music, analysis, and the interpretation of contemporary music courses. As an administrator, he has served on the board of directors of New Music Concerts, Pro Arte Orchestra and The Classical Accordion Society of Canada Inc., as well as the Canadian Music Centre, Mississauga Music Council, Mississauga Civic Centre Opera, and Guelph Performing Arts Centre. He has won numerous awards and citations, has represented Canada in two world accordion championships, received the Guelph Civic Ring, and was named Mississauga Musician of the Year in 1987. We caught up with Joseph to discuss his long and storied career, how he brought the accordion to the forefront of music around the world, and changed the perception of this instrument for the better. Soundstreams: How and when did you begin playing the accordion? 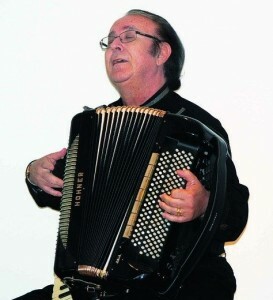 Joseph Macerollo: I began accordion lessons (for fifty cents a lesson) in my hometown of Guelph, Ontario when I was six. My teacher was an itinerant, self-taught accordionist who entertained at social functions like weddings. He met my parents at one of these functions, and their discussion led to him coming to the house to let me try a beginner model accordion. I fell in love immediately, and became focussed on achieving excellence in local competitions, and performing at charity events, hospitals, nursing homes, the Guelph Reformatory, and many more over the years. SS: You were awarded the Order of Canada in 2013 for your “pioneering achievements as a musician and educator, and for bringing the classical accordion to Canadian concert halls,” according to the Governor-General’s website. In your opinion, how has the public perception of the accordion changed? JM: Public perception of the accordion, from its cultural roots to more diverse serious environments like concerts, has evolved over many years. In my career, changes in public perception began around 1970, with the accordion syllabus at the Royal Conservatory of Music, and the addition of accordion majors at Queen’s University and the University of Toronto in 1972. Three factors were critical in how things have changed over the years: manufacturing changes (to a free bass instrument), access to enlightened musical education for youth, and new accordion repertoire by composers. SS: The accordion has recently seen resurgence due to groups like Mumford and Sons and Arcade Fire using it in their music. What kind of reputation do you think the accordion has in concert halls, versus in popular music? JM: Each genre has its own relevant audience. Visibility in popular music is important since many young children see the accordion being used as an accessory to the band’s appeal, and these young audiences are not as averse to its past “square” image. In concert music, audiences have witnessed both acceptance and excellence by talented accordion performers, composers, and its inclusion by performing organizations. Each audience accommodates the inclusion of the instrument consistent with the circumstance [of how it is presented]. SS: You’ve performed with orchestras and have brought your music all around the world. What are some of the highlights of your travels? How is accordion music received in different countries? JM: New music that was played in my visits to the Netherlands, Finland, Germany, France, Italy and Russia were European highlights. I always performed original music, and I admit the challenge was immense to convince foreign audiences that a Canadian could communicate and had substance, but in the end, it always worked. I tend to preface in dialogue with the audience how and what I am doing in my performance. The large audiences I reached from 1998 to 2002 as a member of Quartetto Gelato, performing more accessible repertoire, were also very gratifying. SS: More than 200 works have been commissioned specifically for you from Canadian composers, including La Testa d’Adriane by R. Murray Schafer, which you will be performing in Squeezebox. Are you excited to revisit this unique piece? What other sopranos have you performed it with, and how do you approach it with each unique individual? JM: I am always excited to revisit Murray’s La Testa d’Adriane, which challenged me to not only play the notes, but also to talk and act in 1978, which I was reticent about. My original ‘Testa’ was the wonderful Mary Morrison. Other women who have played the character include Mary Lou Fallis, Laurie Romero, Brooke Dufton, and in this concert, Carla Huhtanen. There have been performances with sopranos in the United States, Sweden, Italy, the Netherlands, and Russia, to name a few countries. This piece has become a staple for other accordionists world-wide since I recorded it on an album in the late ‘70s. Each soprano has her own breathing style, especially since they are restricted by being inserted into a round table. My timing of the events makes allowances for each singer’s comfort level and the duet between us is important. SS: What is a common piece of advice that you like to give your students? JM: My most common advice to students is to retain a powerful work ethic, be patient with my approach which takes one into uncharted territory, and embrace the challenges of interpreting new music. The DNA of a note is its time, supported by a myriad of tonal responses based on variables of arm pressure to the bellows, and horizontal rather than vertical projection of a two-manual instrument. Intense examination of these complex issues is the hallmark of my approach. SS: What activities do you enjoy outside of your career? JM: Outside of my career, I enjoy photography, being a sous-chef to my wife for the many parties we have (aka pot cleaner), looking after my grandkids, acting as a consultant to students, and sitting on boards of directors for diverse arts organizations.